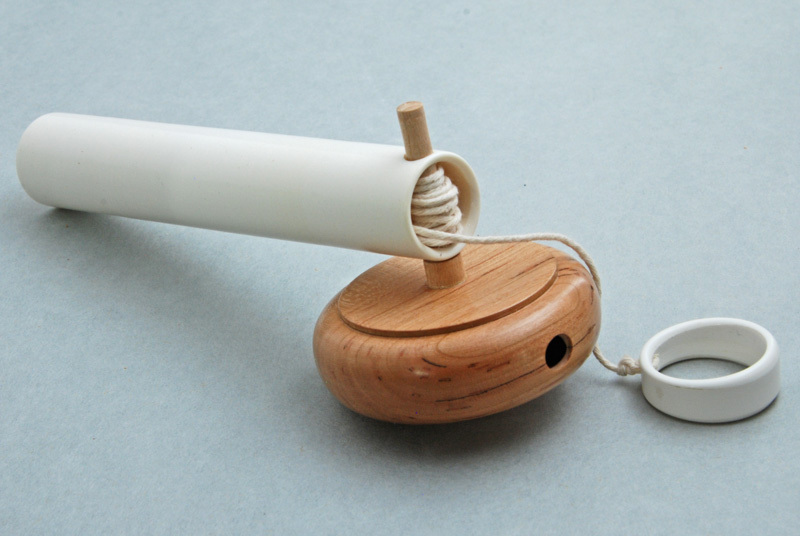 Finger spun tops are great for portability, but if you want to spin a heavy top, or need high rpm to make a whistling top work, you’ll need to have a string operated launcher. 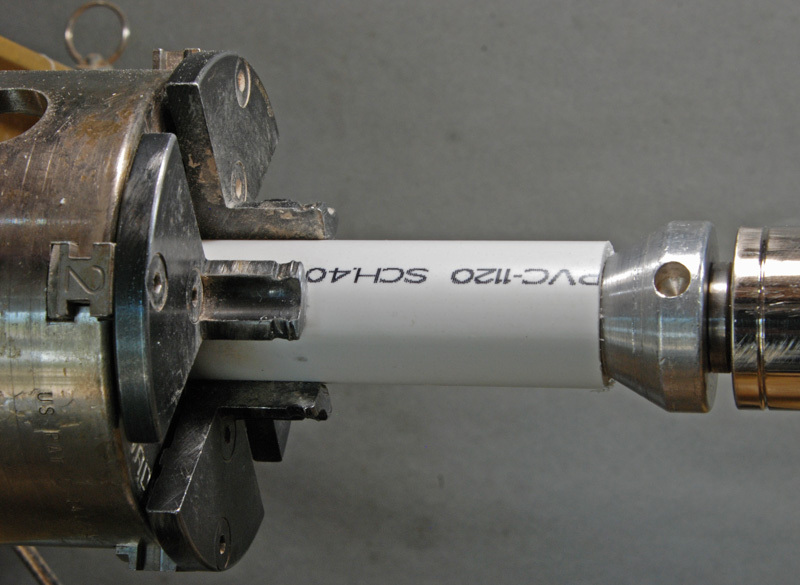 This article tells how to make a top launcher out of 3/4” and 1” schedule 40 PVC pipe. 3/4” pipe is used for the launcher tube, and 1” pipe is used for the pull ring and sleeve to protect the launcher tube from the chuck jaws. 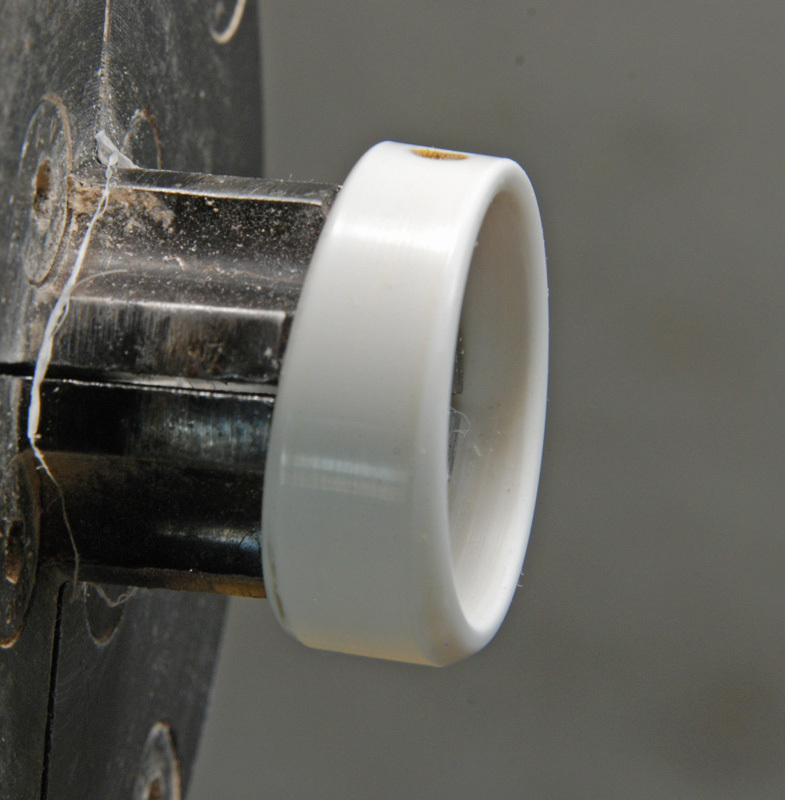 Briefly, the blanks for the pull ring and sleeve are cut off a short section of 1” pipe mounted on the lathe. The sleeve is beveled, then a slot is cut lengthwise using a bandsaw or hand saw. The pull ring is trimmed, and then mounted for tapering using the tailstock ram and a wedge. 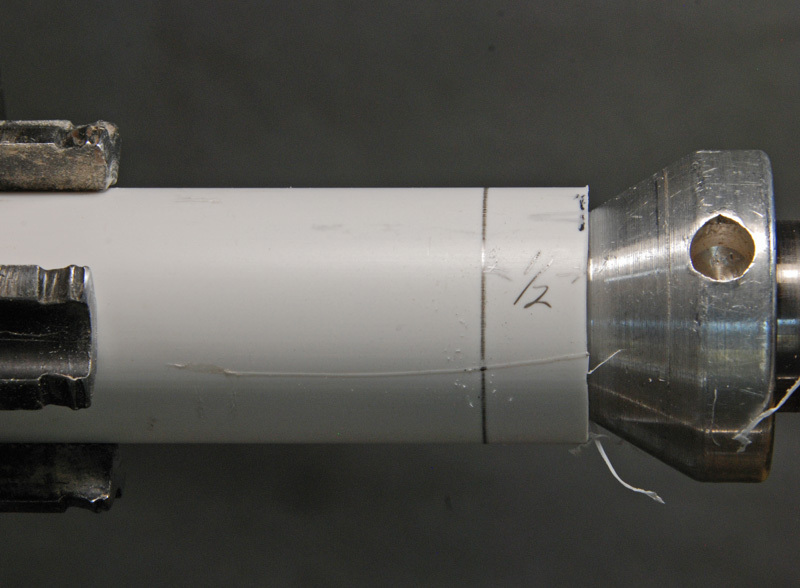 The launcher tube, or handle has a hole for the top shaft drilled off lathe, and then is trimmed and the ends rounded using the sleeve. All lathe work is done with #1 jaws on a 4-jawed chuck. In general it’s not a good idea to cut round objects with a bandsaw or table saw, as the blade may grab the object, rotate it into the blade and cause a bunch of excitement. With PVC pipe it’s even worse, as if the blade does catch the pipe may shatter into sharp pieces and pepper you with sharp shards. 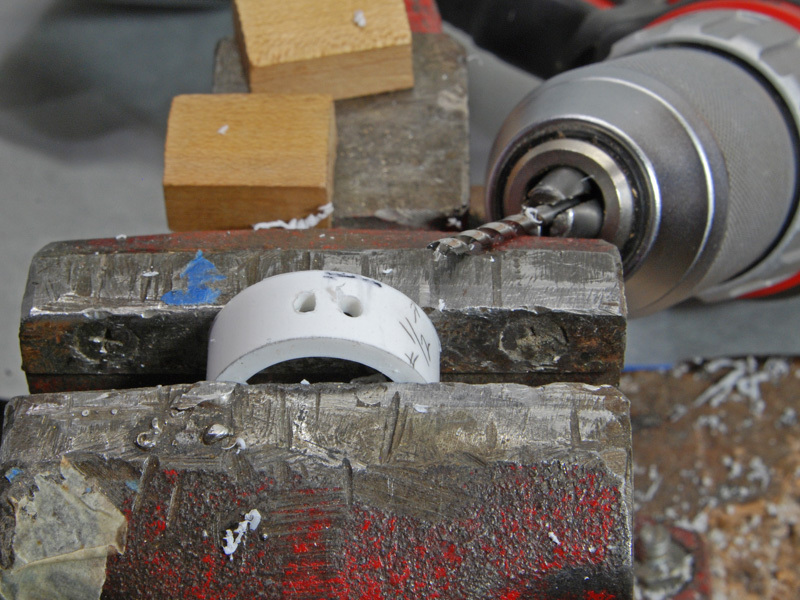 We do need ends cut smoothly at a right angle—so here’s how to do more safely. 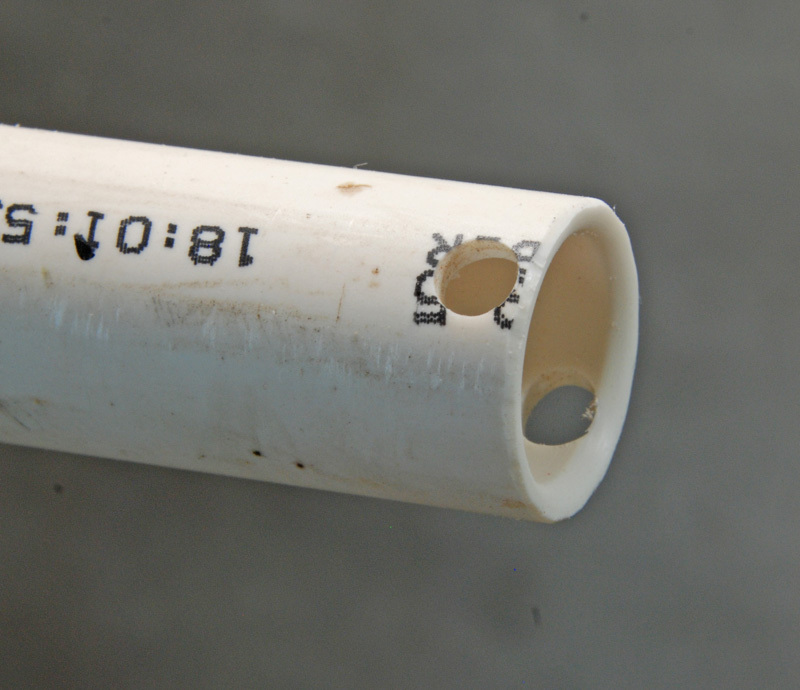 Cut a 4” or so section of 1” PVC pipe with a handheld saw. Chuck it up in your 4-jaw chuck using #1 jaws (The photos show my Oneway Stronghold chuck. Your chuck manufacturer may call them pillar jaws). Put a large cone center on your tailstock center and bring it up to support the free end of the PVC pipe as in Figure #1. 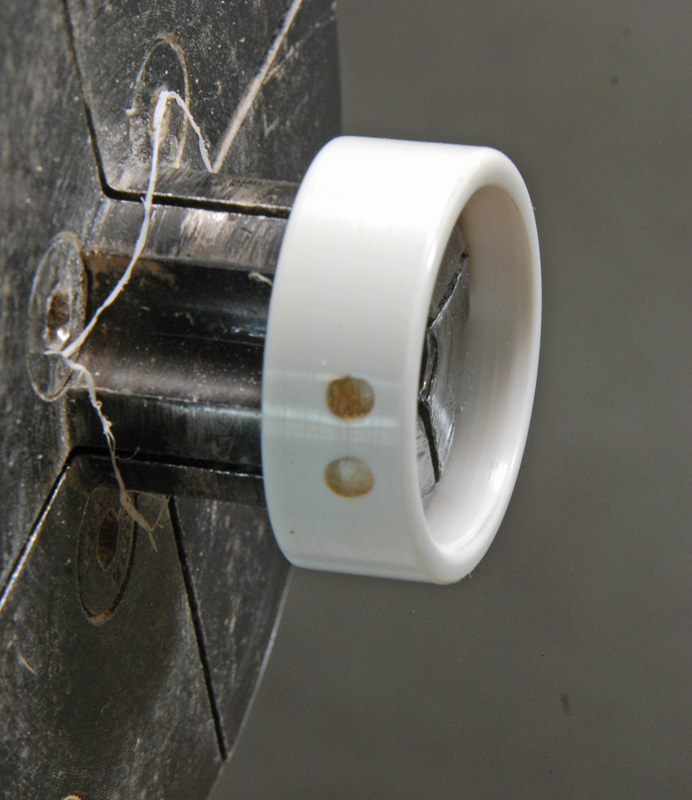 If you don’t have a suitable cone center, instead turn a short wooden plug to fit the end of the PVC pipe and use any tailstock center. 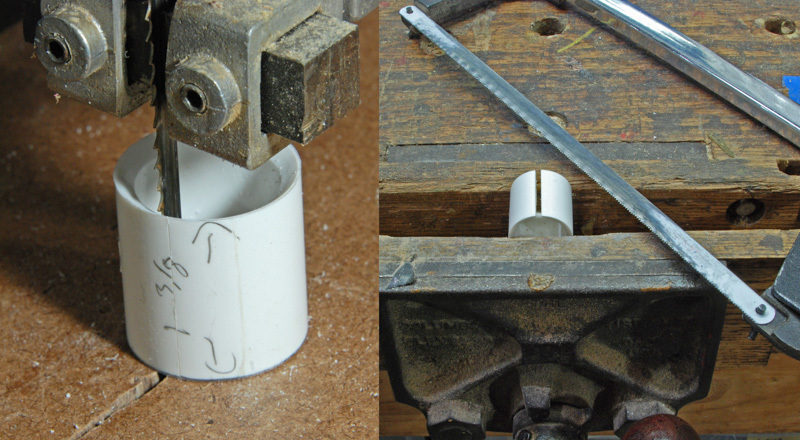 Figure #1: Mount 1” PVC pipe in your chuck. 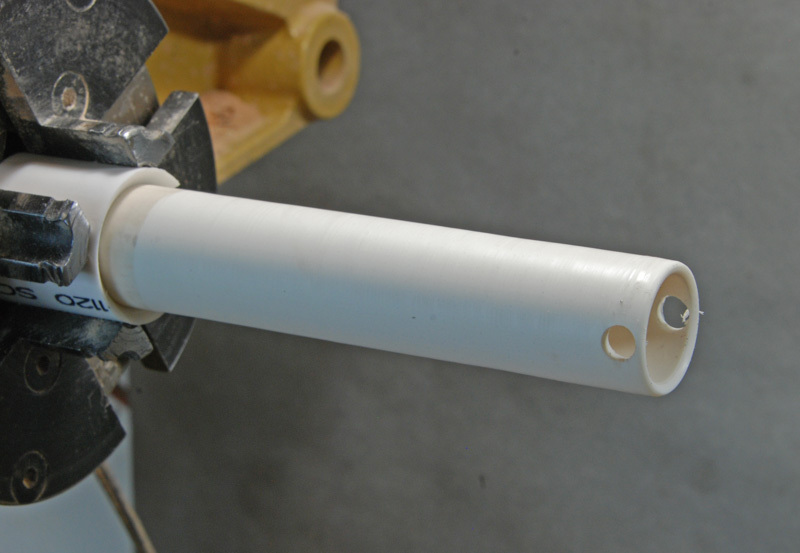 Use a narrow parting tool to cut through the PVC pipe far enough from the end that you’ll cut through before hitting the tailstock center as in Figure #2. Back off the tailstock center so you can remove the cut off end and bring the tailstock center back in. Use a pencil to mark the pipe 1/2” from the end as in Figure #3. Cut through the pipe again at the mark to make a Pull Ring blank. Make a new mark 1-3/8” (or a little longer than the height of the jaws you’re using) from the new end for the Sleeve blank as in Figure #4. Remove the Pull Ring Blank, restore tailstock center support, and cut the pipe at the latest mark to create a Sleeve blank. Figure #2: Trim the end of the PVC pipe square and smooth. Figure #3: Mark for a 1/2” Pull Ring Blank. Figure #4: Cut off the Pull Ring Blank and mark for the Sleeve blank. Chuck up the Sleeve blank in your chuck and turn a bevel on the end facing inward as in Figure #5. A skew laid flat on its side or other negative rake scraper should work well. 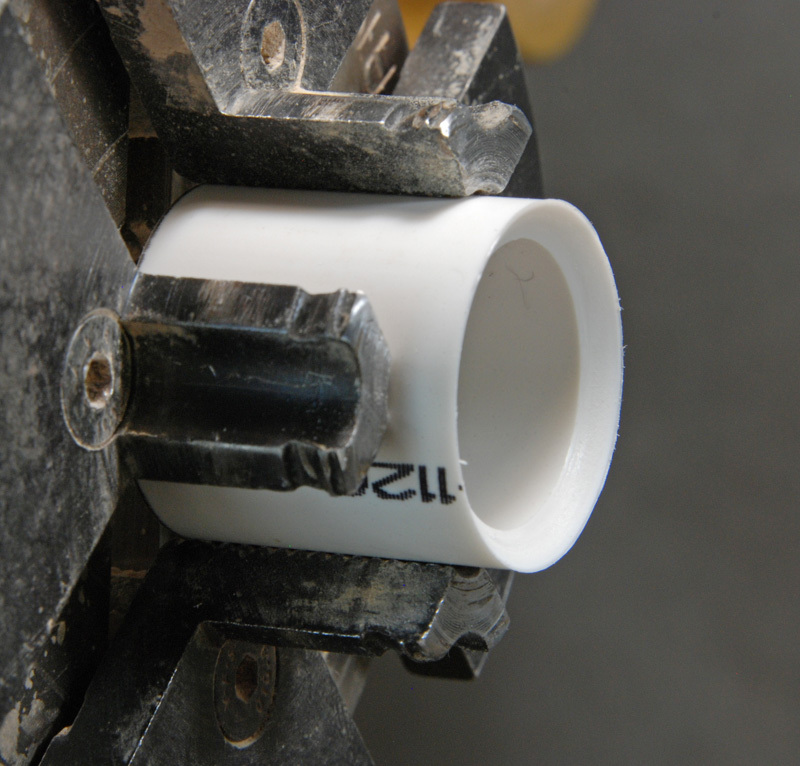 The bevel will let you load the 3/4” PVC pipe into the Sleeve more easily by just pushing it in. Figure #5: Bevel the end of the Sleeve blank. Now cut a slot lengthwise in the Sleeve. If you have a fine toothed blade on your band saw you should be able to cut the slot safely on the bandsaw because the flat end will rest on the table. Cut through the wall of the Sleeve to the inside, then turn it around and cut back out about 1/8” away from the first cut as in the left image of Figure #6. If you have a coarser blade on your bandsaw or just don’t feel safe doing it this way, clamp the Sleeve blank lengthwise in a vise and use a handsaw to cut the slot as in the right image of Figure #6. Figure #7 shows the completed Sleeve. Figure #6: Two ways to cut a slot in the Sleeve. Figure #7: The completed Sleeve. Clamp the Pull Ring blank end to end in a vise and drill two 1/8” holes to attach the pull string as in Figure #8. The holes should be centered between the ends and about 3/16” apart. 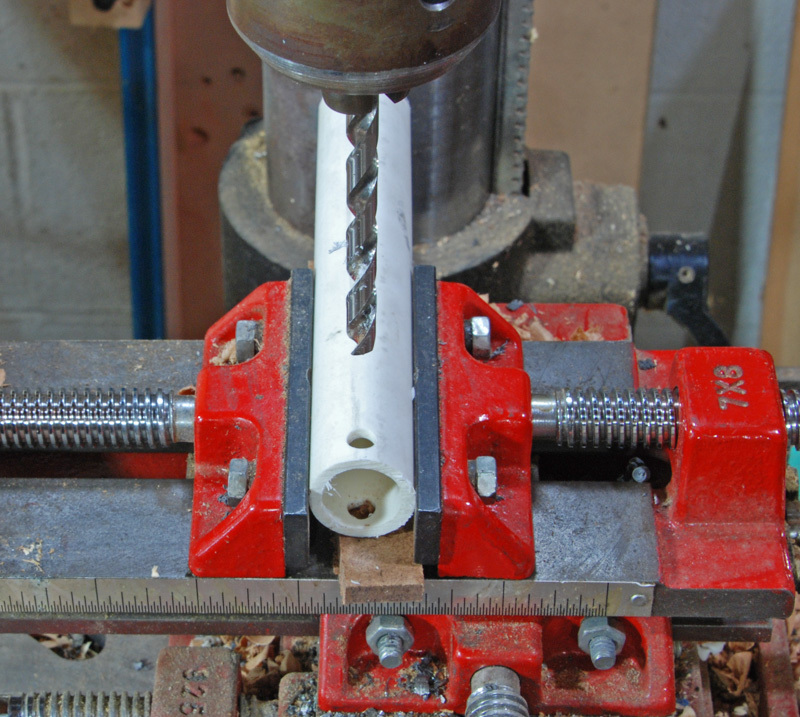 Figure #8: Drill holes to attach the pull string in the Pull Ring blank. I experimented with various tools for turning the PVC. I found that a skew on its side worked well for narrow cuts. It gave a nice surface with light pressure, and removed a reasonable amount of PVC with increased pressure, but didn’t tend to dig in and spall out chunks. But as my skews are ground straight across, it was difficult to transverse a long surface without digging in the toe or heel of the skew. So I made a tool to suit from a 1/2” HSS Drill Blank. It was ground like a skew only straight across with a very slight curve. I used a V-block (like Oneway’s Wolverine) and rotated the tool a little from side to side to round the cutting edge slightly. I also found that a cove tool (also called a wedge tool, but by whatever name simply round HSS ground at a 45°) worked well for inside cuts. To register the Pull Ring blank at an angle I cut a wedge from scrap wood. It’s 2-1/2” long, 1-1/4” wide (non-critical, but it should be wider than the pull ring blank), and 3/16” thick at the thick end. These tools are shown in Figure #9. Figure #9: PVC turning tools. 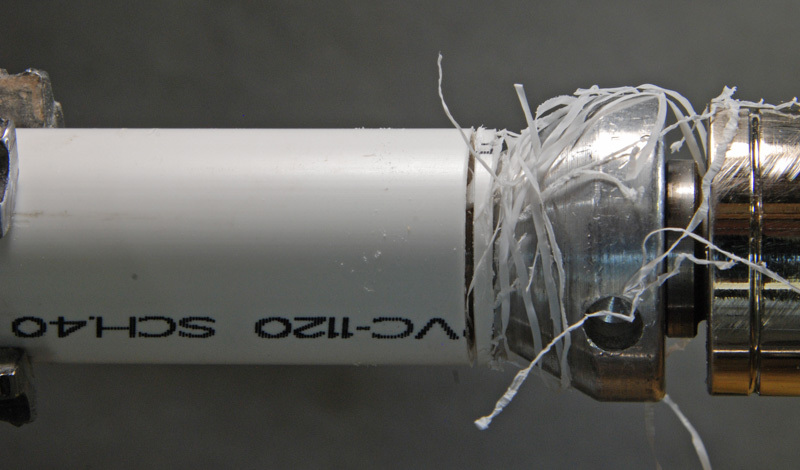 PVC pipe is extruded, so it’s not really skin friendly smooth on the inside. To true up the inside mount the Pull Ring blank externally in the 4-jawed chuck. Bring up the tailstock ram close (~1/16”) to the faces of the jaws and use a finger on one hand to push the Pull Ring blank against the tailstock ram while you tighten the jaws with the other hand as in Figure #10. Avoid over-tightening the chuck. You want it tight enough to hold the blank but not tight enough to visibly distort it. True up the inside surface of the Pull Ring blank with a cove tool (or perhaps a negative rake side cutting scraper) as in Figure #11. Then sand and polish the inside of the Pull Ring. 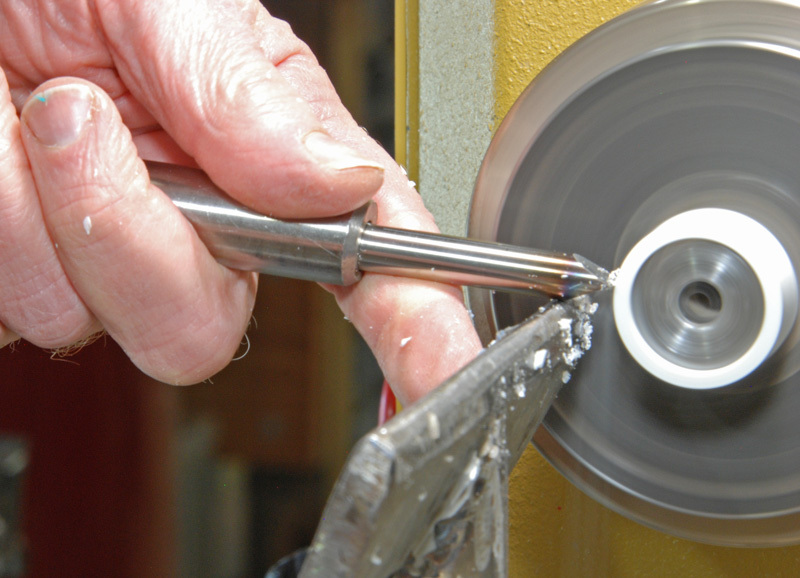 It’s a good idea to slow down the lathe and use light pressure so that you sand, rather than melt, the surface. If you can remove the swarf on the sandpaper by wiping it on your jeans the lathe is slow enough. Sand with progressively finer grits followed by 0000 steel wool. A plastic polishing formula will probably give a final gloss. I didn’t have any, but did have some antique (circa 1979) Brasso, and it worked fine. Figure #10: Mount the Pull Ring blank for turning the inside registering against the tailstock ram. Figure #11: Turn the inside of the Pull Ring true. Now mount the Pull Ring internally on the chuck registering it against the tailstock ram. Use a slightly rounded negative rake scraper to trim the outside of the Pull Ring as shown in Figure #12. Sand and polish the outside of the Pull Ring as shown in Figure #13. Figure #12: Turn the outside of the Pull Ring true. Figure #13: Sand and polish the outside of the Pull Ring. Now use the tailstock ram and the wedge to mount the Pull Ring to taper the edge. The jaws should only be about half way into the Pull Ring or they will tend to straighten it back out. Bring up the tailstock ram near the jaws, place the wedge between the end of the ram and the Pull Ring, and push the Pull Ring against the wedge with one hand while you tighten the chuck. 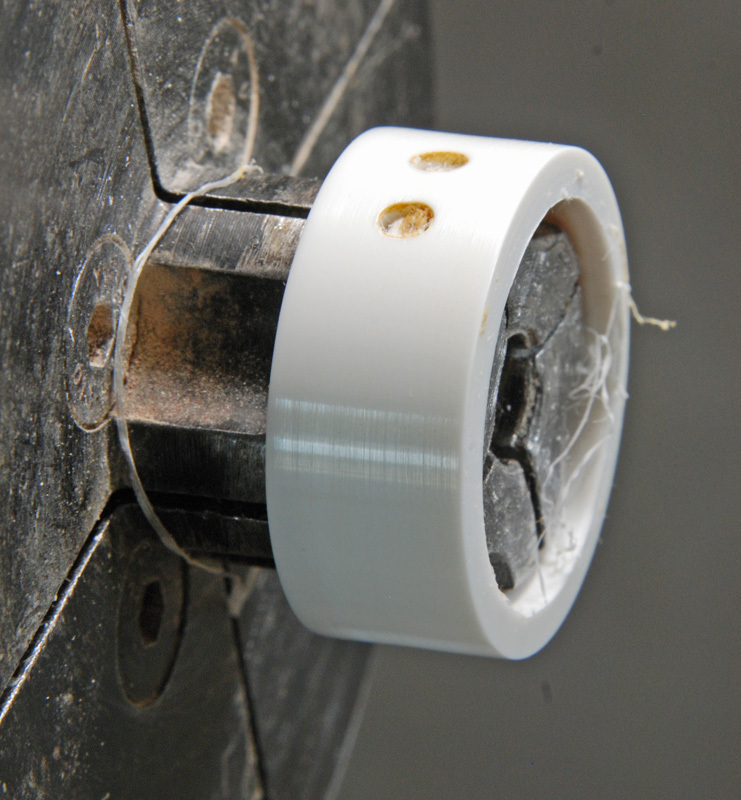 The pull string mounting holes should face the narrow edge of the wedge. Figure #14 shows the mounting. 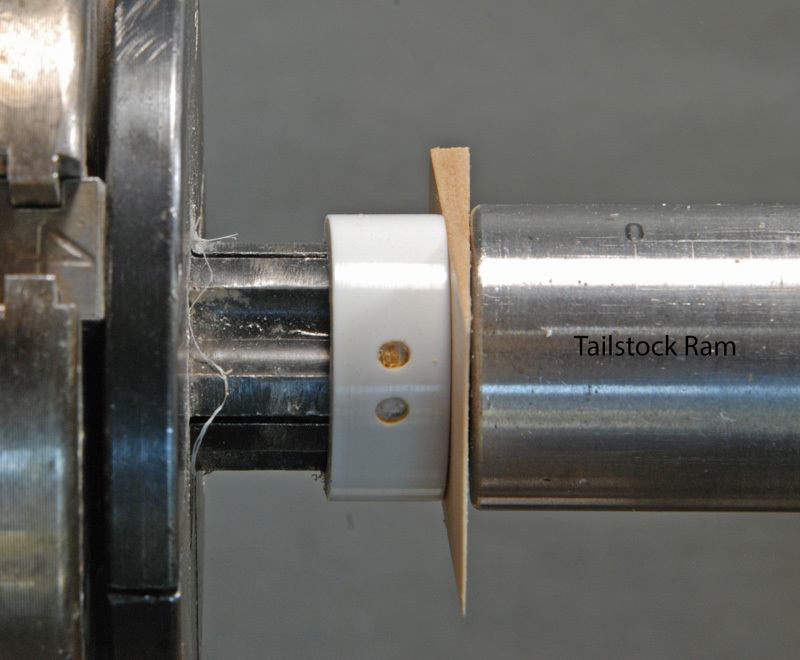 Figure #14: Mount the Pull Ring for tapering by registering against the wedge and tailstock ram. Use a skew on its side or negative rake scraper to taper the side of the Pull Ring and round over the rim. Then sand and polish the rim as in Figure #15. Figure #15: Taper and then sand and polish one side of the Pull Ring. Repeat these steps to taper the other side of the Pull Ring. The completed Pull Ring is shown in Figure #16. Figure #16: The completed Pull Ring after tapering the second side. 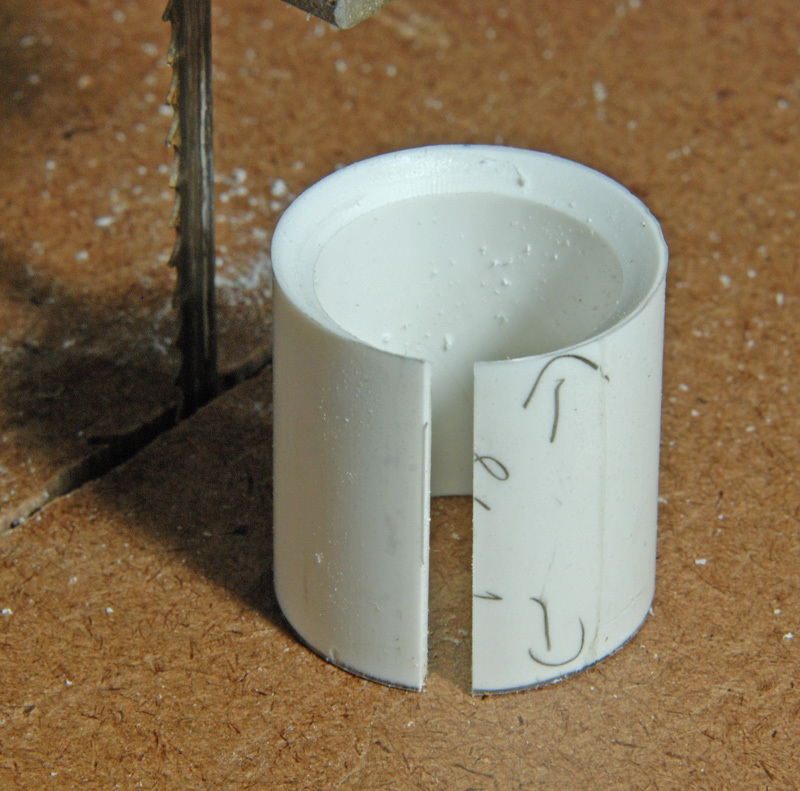 Cut a piece of 3/4” PVC pipe a little longer than 6” to allow for trimming the ends. 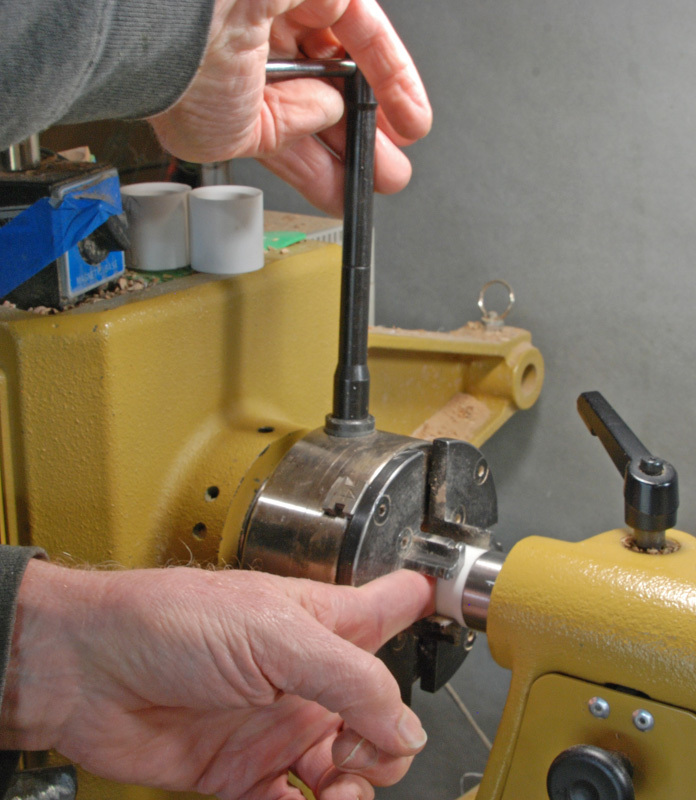 Drill a hole 1/32” inch larger in diameter than the diameter of your top’s shaft near the end. In Figure #17 I’m using a compound sliding vise mounted on my drill press table to hold the pipe for drilling, but a V-block would also work, as would careful drilling by hand-held drill. Lightly chamfering the edges of the hole with a countersink or larger drill bit will make it less likely to mar your top shaft. Figure #17: Drill a hole for the top’s shaft. Place the sleeve on surface with the beveled end facing up and push the handle blank into the sleeve. Then mount it in your chuck, with the slot in the sleeve in between jaws as shown in Figure #18. Bring up a large cone tailstock center for support. Trim the end with a narrow parting tool as you did before in Figure #2. 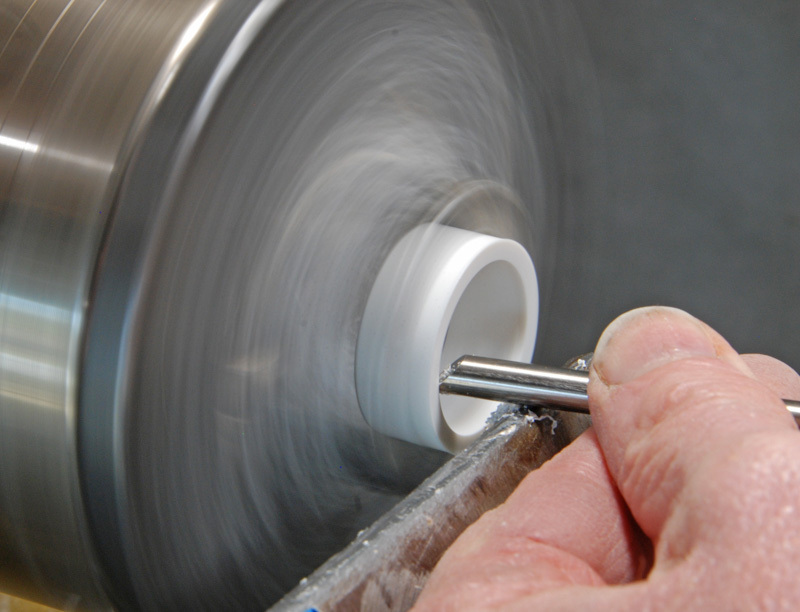 Figure #18: Mount the handle blank using the sleeve and a large cone tailstock center. 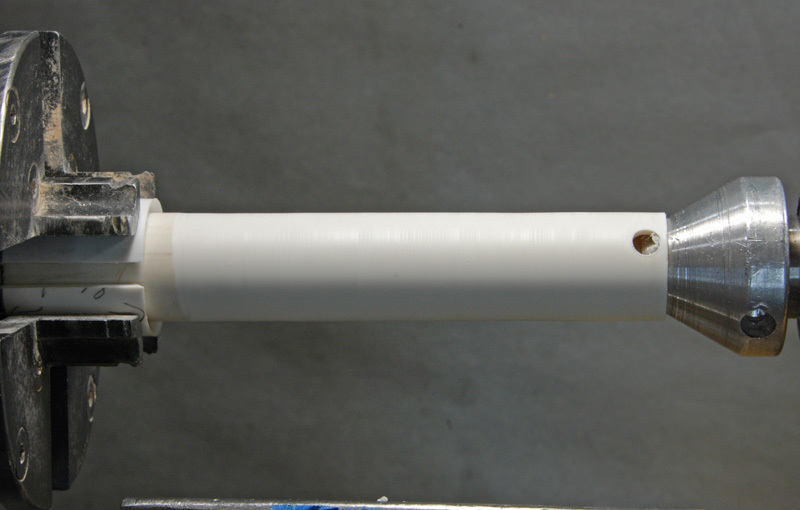 Back off the tailstock center and round over the inside of the end of the PVC as in Figure #19. I found that a small skew used as a negative rake scraper is a good tool for this cut. Figure #19: Round over the inside of the end of the launcher blank. Bring the tailstock center back up to support the launcher blank and turn the blank to round over its exposed length and remove any printing as in Figure #20. A very slightly curved negative rake scraper works well for this. You may start cutting with a spindle roughing gouge, but keep your cuts light or you may actually spend more time with the scraper or sanding due to aggressive cuts pecking out little chunks of PVC. Some practice on scrap tubing, paying attention to the sound of the cut, and frequently checking the cut surface may be worthwhile. Figure #20: Turn the outside of the launcher blank smooth and printing free. Back away the tailstock center again and round over the outside of the end of the launcher blank as in Figure #21. Then sand and polish the exposed portion of the launcher as in Figure #22. 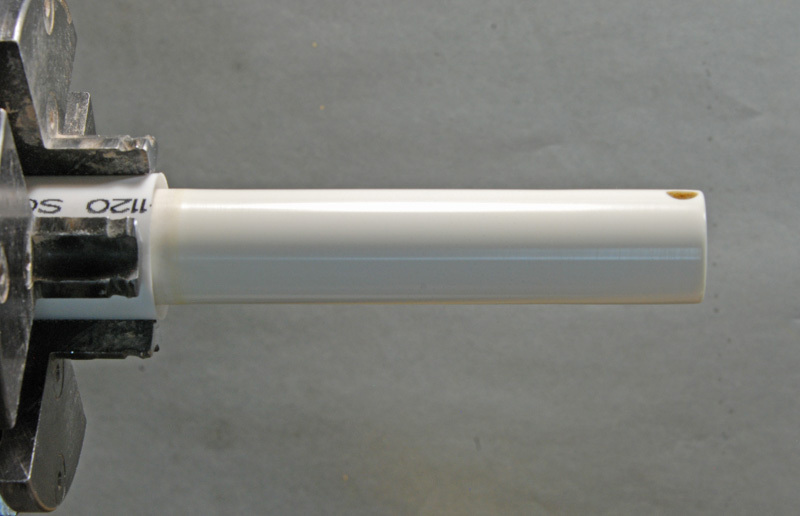 Figure #21: Round over the outside of the end of the launcher. Figure #22: Sand and polish the launcher. Now reverse the launcher blank in the sleeve and follow the same sequence to turn the other end: Trim the end; round over the inside rim; turn the outside; round over the outside rim and sand and polish. The remove the completed launcher. The last step is to attach a pull string to the pull ring. For really light weight tops you can add some color by using crochet cotton. Heavier tops with more rotational inertia will require something stronger like twine. Cut a piece of string about 20” long. Over a non-stick surface put a drop of CA glue on one end of the string as in Figure #23. After it hardens cut the tip to neaten it with scissors or a knife as in Figure #24. 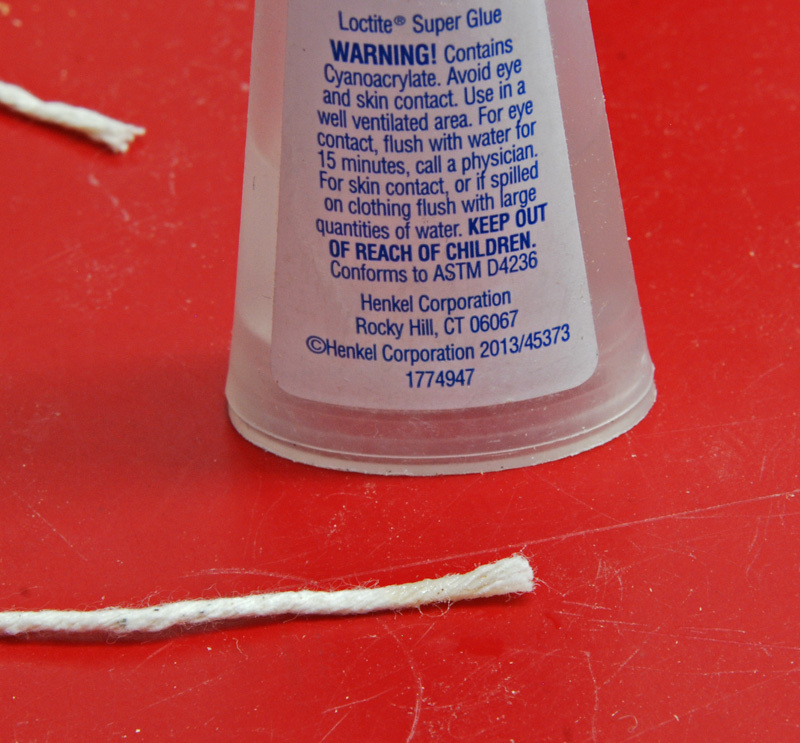 Figure #23: Harden the end of the string with CA glue. 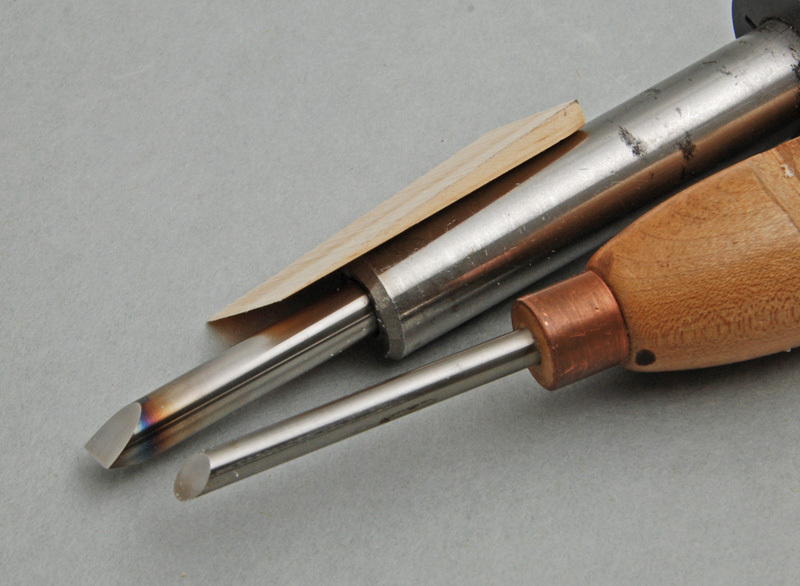 Figure #24: Cut the hardened tip to neaten the end. Pass the other end of the string through the holes drilled in the Pull Ring and tie a knot. 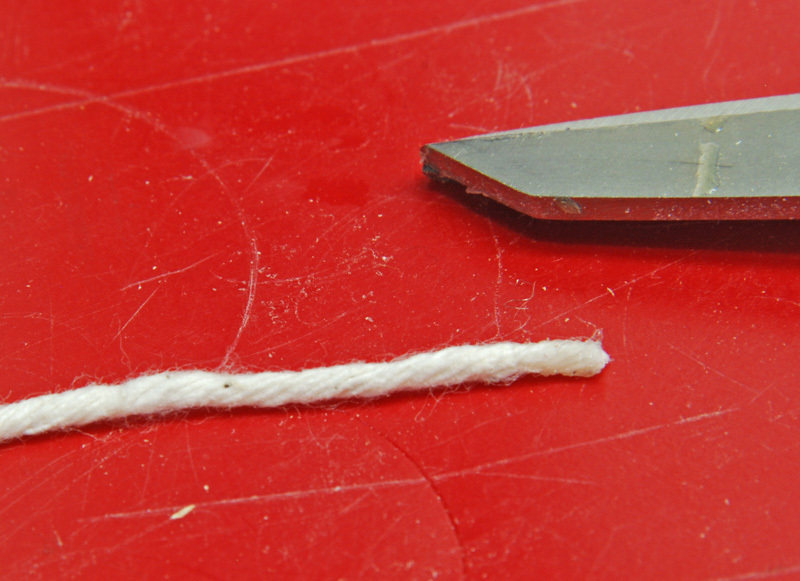 Then harden the knot with a drop of CA glue and trim off the end as in Figure #25. 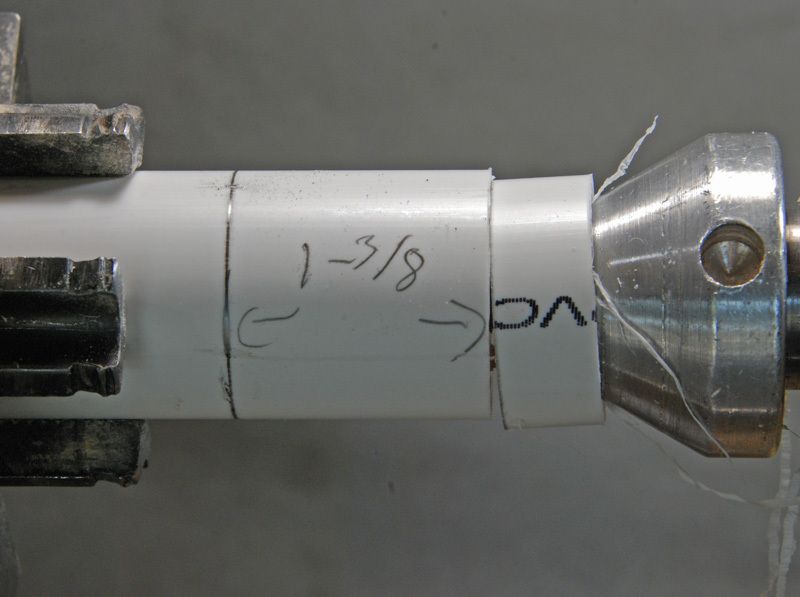 Figure #26 shows the completed launcher. 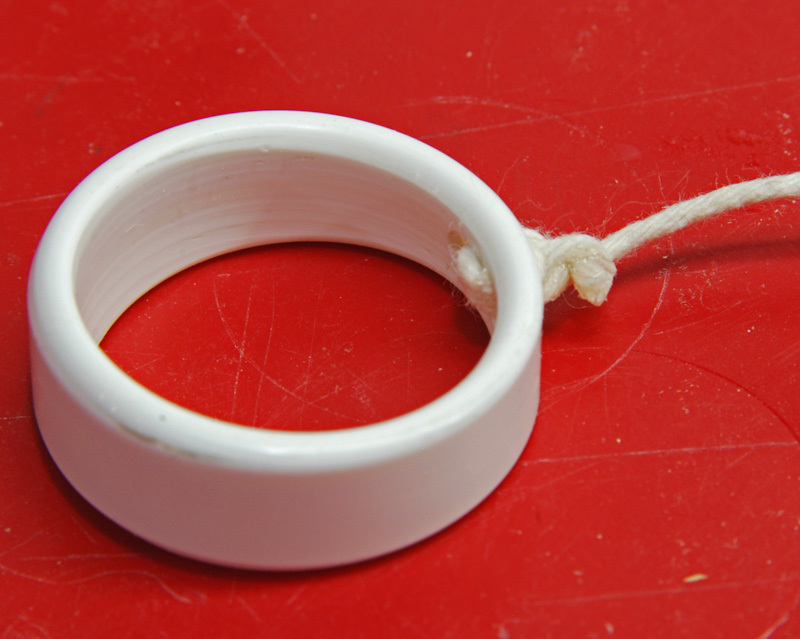 Figure #25: Tie the string to the Pull Ring and harden with CA glue. 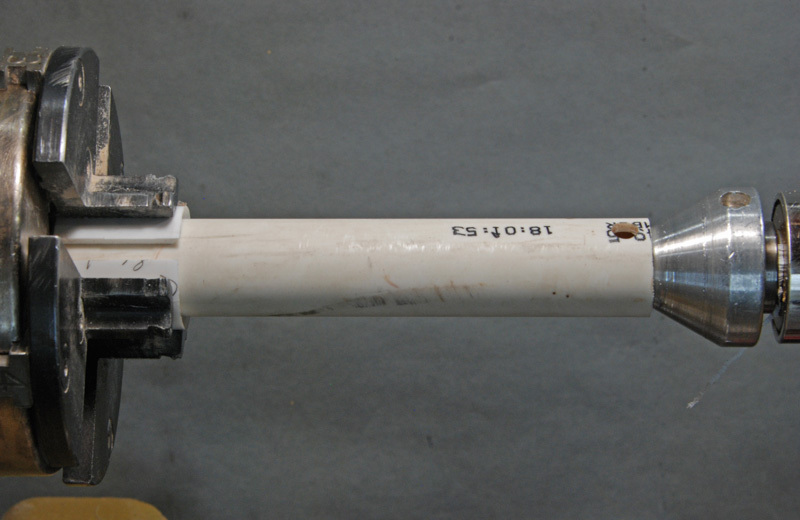 Figure #26: The completed launcher.